“THE ODESSA JOB” is launching! VulgarGrad are performing at the Huon Valley Mid Winter Feast (Tas) on 13 and 14 July. OK, OK – we know it’s been a long time. To make up for it, we’re doing 2 shows in Sydney for Vivid Festival at Marrickville’s very own Camelot. Click here for details. VulgarGrad return to the Gasometer after the sold-out Pierogi Pierogi spectacular in May. How much gravel can you fit in a voice? Find out when the Russians team up with New Orleans howler Pugsley Buzzard and his band. Vodka vs. Bourbon in Collingwood. Russian Criminal folk-ska-swing-punks Unite! In solidarity with the workers of the world Pierogi Pierogi return their highly successful Polish pop-up kitchen to The Gasometer to put a tasty dumpling shaped spanner into the machinations of an oppressive flavourless state. Home made lemon vodka will flow! The disenfranchised will rise up! Pierogi, classic polish soup, pickles and kanapka – traditional open sandwiches; a veritable workers feast to nourish and drive the radical heart! Shoulder to shoulder we will sing, laugh, eat and cry! The International Workers Day kitchen take over will reach fever pitch after dinner with musical accompaniment from our friends in low places, Russian criminal folk revolutionary bards VulgarGrad and their very special guests, gypsy apparatchiks Vardos Trio. Vodka will flow until the bar is closed. Eat Pierogi and make love with Vulgargrad. 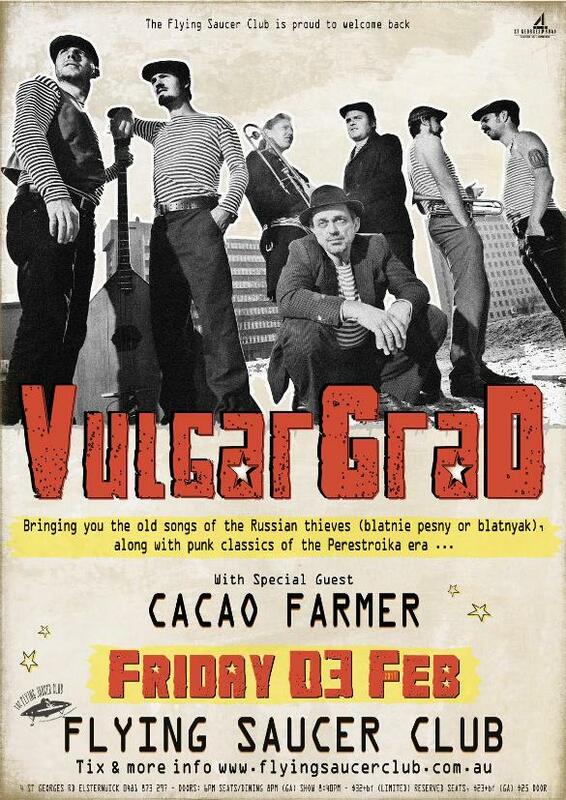 Sydney folks – this is a very rare opportunity to catch VulgarGrad in your hometown. Totally free public outdoor event – what more could you ask for! Check out this link for more details.